Google Drive is not your traditional filesystem..
And... it so happened that I had shared a folder with my wife and from her account had copied a big chunk of our picture album into my folder before realizing that I was exceeding her quota..
At that moment I cancelled the operation and deleted the folder from my account. However in Google Drive somehow files have more of a database like approach, in fact Google Drive even allows for a folder to contain multiple files with the same name (because they have different IDs). What happened after I deleted my folder with her files was that all of her files remained in her account (and thus taking quota) but nowhere to be found (because I deleted my 'parent' folder). I googled but could not find any solution, even Google's own specific link (https://drive.google.com/#query?view=2&orphans=0) didn't work. 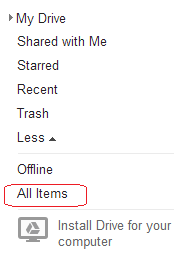 I found that I could go see the files on the 'All items' option of Google Drive ( in detailed view the files have the parent folder name right after them, in orphan files there's nothing). However to select manually over 9000 files and then move each bunch of files manually from the "All items" was taking forever.. It claimed to fix things but it wasn't working.. so I saw that I had to take it into my own hands..
Brought up eclipse and started on it..
After that, I had to locate all files. After that, to locate the orphaned files, it was simple once I saw that Parents is an attribute of files. To play it safe I had to check for repeated filenames. Filenames in Goole Drive are "Titles" and as said before they can be repeated (I did not dare test how it would show in your explorer's replica of Google Drive if you have two files with the same name on the same folder). System.out.println(name + " count is "
I didn't dare moving the files immediately after renaming because I was unsure how Google's eventual consistency would react, so I waited a few seconds an then ran the code to move the files into a new folder. That was all, I hope you find it useful. Did you execute this as one function in eclipse or in terminal? I called everything from eclipse.